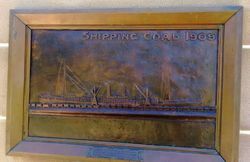 The Coal Monument was erected by the citizens of Newcastle as symbolic of the coal mining industry for which the city of Newcastle was famous. 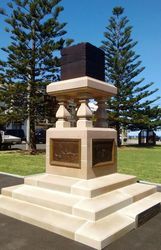 The foundation stone of the "Coal Monument" was laid during the jubilee celebrations of the incorporation of the municipality of Newcastle in 1859. The monument indicates that the output of coal was 308218 tons in 1859 and 6511002 tons in 1909. The monument was originally located in Pacific Park and relocated when Hunter Street was extended between 1923 and 1929. 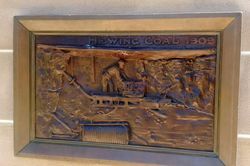 The monument was restored in 1986 with a grant from the Joint Coal Board. In 2017, the monument was dismantled, revamped, and replaced close to its previous location in Parnell Place Park. In connection with the celebration of the municipal jubilee of Newcastle, an interesting ceremony was performed on Monday. 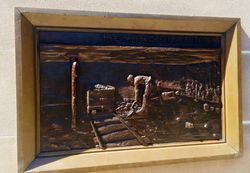 This was the laying of the foundation stone of a monument emblematic of the great coal industry, for which the city is famous. The site is in Pacific Park, and when completed the monument will be visible from any point of Hunter street, the principal thoroughfare. 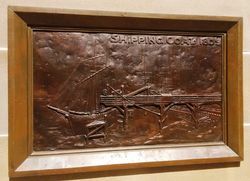 The base of the monument will comprise a flight of three steps of Pyrmont stone, surmounted by a large block, on the four sides of which will be bas-reliefs in bronze, representing the chief phases of the coal industry from mine to ship. This again, will support four columns, on which will rest a marble table, bearing a representation in rough black marble of a big block of coal, the whole being of artistic design. The monument is estimated to cost £420, and the money is being subscribed by voluntary contributions from the citizens in the town and district. There were 12,000 spectators in the park, fully one-third of whom were school children. All the little ones are to receive bronze medals, commemorative of the occasion. Evening News (Sydney), 8 June 1909. John Christian Reid J P Mayor.